Day Six - Tia Falls is at far right. Tamworth is in middle with the red blotch. Coolah Tops is bottom left. Once again it rained overnight, at times heavy but mostly quite lightly. We have a long way to drive today so we need to be up early. We get up just after 7 am and the rain has finally stopped. It is a lot cooler here than the other places we have stayed at. It is about 16ºC. Kelly and I are ready to leave before 9 am but we have to wait for Ron. Why? He left his car keys in his pants pocket and guess where the pants are? In the roof-top tent which is now closed. Donna and he have to open it up enough to reach in and grab the pants. We leave at 9 am and drive back to the Oxley Highway. 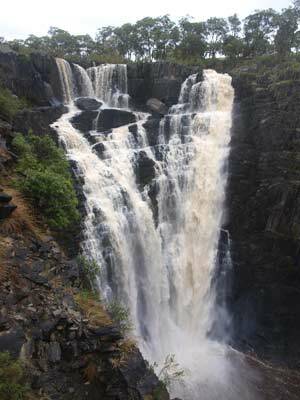 We go a short distance up the highway to Apsley Falls. This is closer to Walcha. 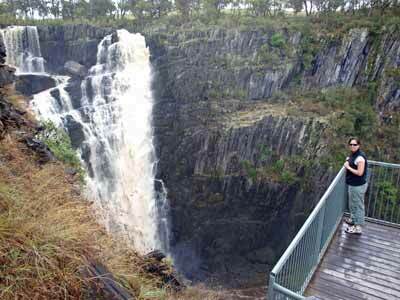 Apsley Falls is brilliant, some excellent picnic areas and a great walk to the waterfall lookout. We drive to the end of the road and walk the short distance to the lookout. In fact, there are a three viewing points for the falls, at least one of which many people would not like to use due to the fact it is cantilevered out over the gorge. The falls have a large volume of water flowing over them. 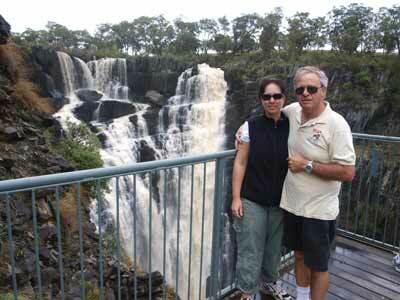 We go to each of the lookouts and are very impressive by the falls, the view and the lookouts themselves. You can get some great photographs of the falls from the lower lookout. There are a number of walks that start from the car park/picnic area. One is a wall that follows the eastern side of the ridge that the road is located on. This gives fantastic views up the gorge towards the east. There are a couple of lookouts along this walk as well. 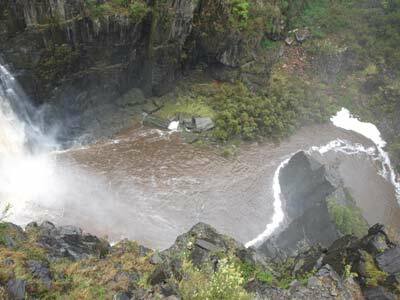 There is another walk that goes over the Apsley River (the water feeding the falls) above the falls and follows the rim of the gorge all the way around, past the opposite side of where the lower lookout is and right around to the eastern side. However, the rain of a few days ago has washed away the bridge that gave access to the other side. The bridge lies in about four pieces. The gorge walk mentioned in the first part of the above paragraph goes all the way to the camping area. After looking at all the views, we drive the short distance to the it. 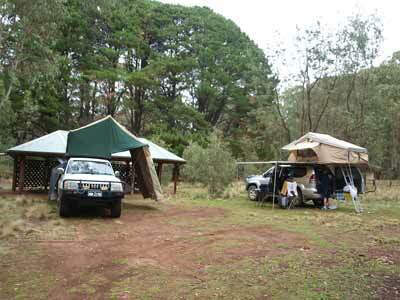 This is another great camping area, with about 15 drive in spots, most capable of taking two cars at a go. Each one has its own table and barbecue (or shares with a neighbour) and there is a toilet block. We decide that we need to come back here for a few days so we can do some of the walks. 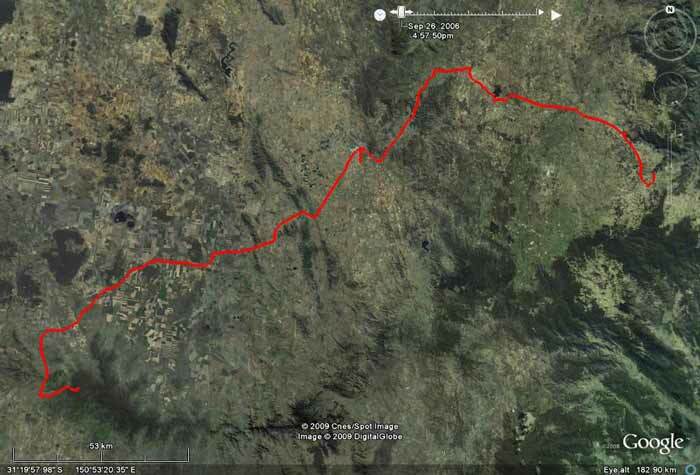 We leave at 10:30 am and 20 minutes later pass through Walcha. We do not have time to stop so we keep on going towards Tamworth. At 10:50 am we stop at a very small town called Woolbrook. 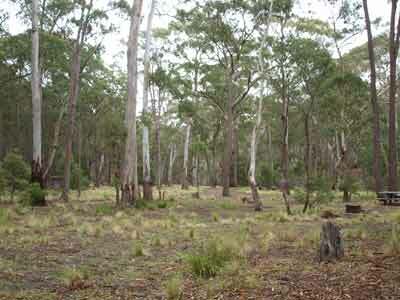 This is located about one kilometre off the Oxley Highway. There is a very nice little rest area next to the Macdonald River and an old timber truss bridge. There is a toilet here as well. We are back on the road at 11:10 am and travel via the New England Highway to Tamworth, arriving at noon. We all need to purchase some things, so we stop at one of the shopping centres near the city's centre. We get some meat pies for lunch and stop at a park just out of town on the highway where we eat them. We still have to refuel and after heading the wrong way out of town (no signs to Werris Creek, our interim destination), we find a service station and refuel. We leave town at 1:45 pm after also refilling our water tanks. We travel via Werris Creek and then cut across the Kamilaroi Highway through Caroona and then via the Coonabarabran Road for a short bit and then at Tamarang we head to Bundella. From Bundella, we go through Pandora Pass, the passage found in early 1823 by Australian explorer, Alan Cunningham, from the upper Hunter Valley into the Liverpool Plains. This provided easy access also from the Bathurst area. It is really quite nice as we start our descent from the highest point of about 800 metres, we have a great view out towards the town of Coolah. 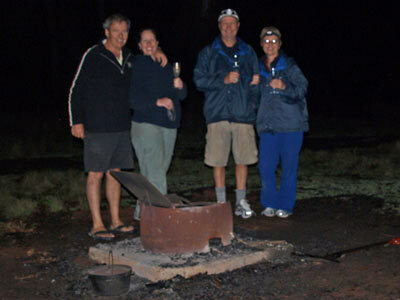 From here it is only 17 kilometres to Coolah Tops National Park. This park is part of the Warrumbungle and Liverpool Ranges and is basically a flat topped plateau with shear cliffs on the northern and eastern side. We enter the park and are amazed at the amount of fallen timber alongside the road. I have never seen so much except in some very remote areas which cannot be reached by the public in vehicles. No need to take wood to this park for a camp fire. We stop and look at the guide just after we enter and decide to have a look at Coxs Creek Camping Area first. 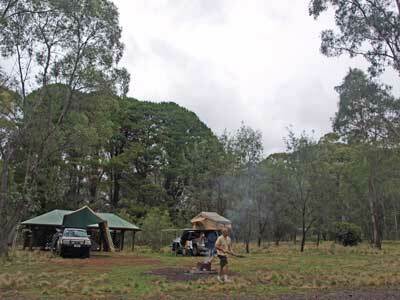 There are two camping areas located down the one road and they are only a kilometre apart, so we plan to visit both and then decide where to stay. It is 3.5 kilometres to the road that runs north to the edge of the park (and the plateau). Only 500 metres along this road is the turnoff to Coxs Creek. It is a further 700 metres to the camping area (GPS S31º 43' 57.9" E150º 00' 37.8" using WGS84 as datum). It is quite a good spot, with toilets, barbecues and some tables (I think). We return back to the road and another 400 metres along is The Barracks Camping Area. We arrive here at 4 pm. The Barracks Camping Area (GPS S31º 43' 50.6" E150º 00' 56.4" using WGS84 as datum) is located on the site of old forestry accommodation buildings (the footings of which can still be seen). This is an excellent site, with a very large shelter shed, tables, a water tank and toilet. There are also wood barbecues. We decide to stay here as it looks like it may rain again soon and we want to stay up to celebrate New Year's Eve. There are two other vehicles here, a family with a camper trailer located about 70 metres away and a couple with a caravan the other side of the shed under some pine trees. I back up to the shed and so that we can extend a cover from the rear of the vehicle to the hut and so, get to the car even if it does rain. It is 1175 metres here so it is a fair bit cooler than the rest of the day. We set up camp and I start the fire. We are again cooking a roast dinner so we need lots and lots of coals. We have a pile of timber with us and there is also some stored under the shed. I soon have a good fire going. We decide to start drinks a little later as we want to be able to last out till at least midnight. Ron, Donna and I have a shower using my car's hot water system. There are lots of kangaroos around here, some very friendly. There is one in particular who comes right up to the shed. 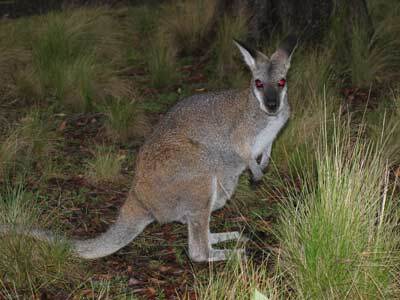 There are also a couple with largish joeys. At 6 pm we start drinks and nibblies and Ron puts on a damper as an entree. The damper is ready by about 6:30 pm and it is delicious. 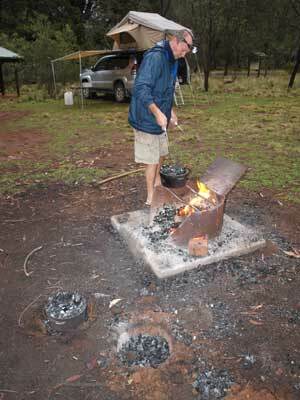 At 7 pm we put on the camp ovens. Unfortunately, the timber is not producing as many good coals as we thought it would so we end up putting the camp ovens on the iron bars on the top of the barbecues and placing coals on the top. This way, we are getting heat from the fire below. Our plan is to have dinner at about 8 pm. It is a bit slower than anticipated and we finally have the roasts ready about 8:30 pm. We again having chicken and pork, but I am cooking the chicken tonight. Our vegetables are carrot, potato and pumpkin, marinated with bush spices and oil. As Kelly forecast, the chicken is not totally done, the legs and wings need a bit more so after taking all the good meat off, we put the rest back onto cook a bit more. Kelly and I have a really good bottle of Australian sparkling and this goes down very well with dinner. While dinner was cooking, I have been preparing a dessert to go in the oven about 10 pm. This is a recipe that my mother got from a TV cooking show in the early 1960s. It is called Apple Crumble, although it is not really crumbly. After dinner, Kelly and I crack open another bottle of sparkling and we decide to play Uno to pass the time till midnight. It is a good laugh. At 10 pm I put on the dessert and around 11 pm it is ready. Really nice, although I should have bought some cream to go with it. We continue with the Uno till midnight. Just before then, Donna brings out a bottle of French champagne. Very nice! At midnight, we light some sparklers that Kelly has brought along and miraculously, the sky opens up and we see some stars and the moon, the first time in over a week we have seen the sky. However, this is soon gone and the light drizzle returns (it has been on and off all night). We play some more Uno before retiring about 1:30 am.